The Constitutional Court said Thursday that it will hold the final pleading on President Park Geun-hye‘s impeachment on Feb. 24, gesturing that it will hand down its ruling by mid-March as planned. Citing the intensity of the issue, Park‘s lawyers requested for extra time but the court effectively dismissed the call. Should the court uphold the ouster of the president over the corruption scandal involving her close friend Choi Soon-sil, the nation will then face an earlier-than-expected presidential election within 60 days -- in this case, in late April or early May. 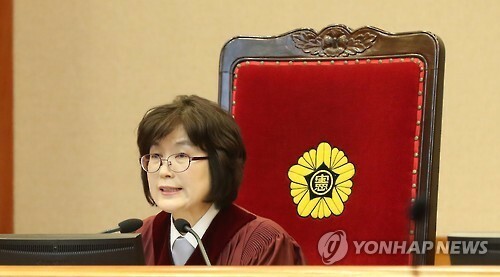 “We plan to wrap up the witness interrogation process (in the next session) and to hold a final pleading on Feb. 24,” said Justice Lee Jung-mi, who is currently acting as chief justice. The last witness examination is expected to involve the scandal’s central figure Choi, as well as former Senior Presidential Secretary for Policy Coordination An Chong-bum. The president‘s attendance, however, is yet certain. Lee also demanded that both parties -- the president’s legal representation and the National Assembly’s impeachment committee -- submit their final written statement by Feb. 23. The court’s decision to speed up the trial process came after it interrogated Jeong Dong-chun, the former chairman of the K-Sports Foundation, one of the organizations affiliated with Choi. Jeong was the only witness to show up, with three others missing. Those who were absent were immediately ruled out of the witness list. The court has recently made it clear that it would rather exclude such unavailable witnesses from the trial, seeking for a speedy procedure. “Should the nonattendance statement lack sufficient grounds, we shall carry on with the trial without resummoning the corresponding witness,” said Justice Lee during the 12th round last Thursday. As Lee is due to retire on March 13, speculations are mounting that the court will hand down its ruling by then. The defendant, however, let out complaints over the quickened pace of the impeachment trial. “(The court) should take sufficient time to review the suggested evidence and to let (both parties) prepare for the final pleading,” said Park’s lawyers. The court replied that it would later consider rescheduling, but refused to immediately alter its timeline. Also, the court ruling may be on any weekday, not necessarily the last Thursday of the given month as is the custom, a court official explained. Meanwhile, whether or not President Park will attend the trial continued to remain a question mark. “We will discuss the issue when the final date is confirmed,” said Park’s lawyer Lee Jong-hwan earlier, refraining from giving a definitive answer. Rep. Kweon Seong-dong of the Bareun Party and chairman of the parliamentary impeachment committee anticipated that the president is likely to shun the trial up to the end.